The University of Kentucky's New Maps Plus program will host a one day, hands-on training/continue education class in QGIS Nov. 30. Cost: $295. 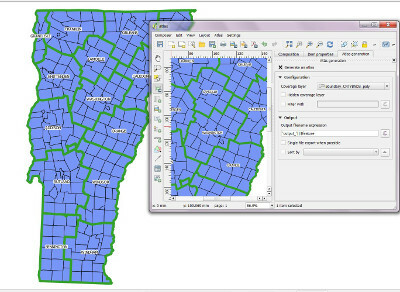 If you are quick, you can sign up for this webinar from VCGI today at 1:30 EST: Creating a Map Atlas in QGIS: A Map Series from One Project. Is there an explanation for why the east sides of cities (New York, London, and Paris) are poorer than the western sides? Yes! "Researchers have found that it’s due to the impact of air pollutants at the time of the Industrial Revolution, as prevailing winds in the U.S. and Europe typically blow from west to east. And it’s an impact that has lasted into today." Media coverage from Marketwatch, actual paper from the Spatial Economics Research Centre (pdf). While there's been talk about it for some time, Microsoft finally released Minecraft: Education Edition. "Explore ideas and lesson plans created by educators covering topics from storytelling and poetry to city planning, sustainable living and geometry." There's even a mentoring program to help educators get up to speed. Ithaca College faculty and students are researching the impact of cannabis farming on the environment. The New Media Consortium (NMC) has released Digital Literacy: An NMC Horizon Project Strategic Brief. It was commissioned by Adobe, and has some valid criticism, but is relevant to those of us working to include GIS in education. Campus Technology offers the Top 10 Education Technologies that Will Be Dead and Gone in the Next Decade. GIS is not one of them, but the computer lab is. The annual Educause Top 10 list reveals the top IT issues that higher education leaders will grapple with in 2017. Number one is security. Number nine is next-gen enterprise IT. I'd put the hot IT topic in higher ed here at Esri, single sign-on, in that pile. Barnes & Noble Education, Inc., which runs bookstores on college and university campuses across the United States and provides digital education services, launched Barnes & Noble Education Courseware "to make it easier for faculty to use Open Educational Resources (OER)." The first 10 courses are introductory and focus on social science. The company will begin rolling out an option to pay for a subscription to a specialization (series of courses with a certificate). Prices run from $39 to $89 per month and provide access to all the courses in the specialization. The current payment model is to pay per course. The fee for the courses in the GIS specialization is $49 per month. Audrey Watters suggests its aimed at getting money from those who feel guilty about not doing the work, akin to a gym subscription. GeoBadges, backed by the American Geographic Society, are built on what was the Mozilla Open Badges effort. That framework is no longer the purview of the Mozilla Foundation. Mozilla is passing the torch on the Open Badges initiative to the IMS Global Learning Consortium. The City of Cambridge and Salisbury University planning and GIS departments administered a mobile housing blight study early in November. Ten students from Dr. Michael Scott’s geography classes and Dr. Amal Ali’s planning classes at Salisbury University measured risk variables in residential neighborhoods throughout Ward 3 of the Maryland city. A University of Tennessee team attended the Morgan County College and Career Fair at the Wartburg Vocational Center. Several hundred middle and high school students and teachers had the chance to see how geography and GIS matter. Geo for All is looking for volunteers to produce a simple webform and website for publishing data for an annual Open Source Report Card. VR is coming to geography (and other) classes at Penn State. The United States Geospatial Intelligence Foundation (USGIF) created a “GEOINT 101” presentation to share with 50 fifth grade students at Moorefield Station Elementary School in Ashburn, Va., Nov. 16 for GIS Day. OpenStreetMap is participating in GeoWeek, aka Geography Awareness Week, again. Michigan State is celebrating Geography Awareness Week by noting its new name (Department of Geography, Environment, and Spatial Sciences) and hosting a film about water scarcity in Kansas. There's a podcast with department chair Alan Arbogast in the article. Esri offers a generic memo to campus IT directors supporting the implementation of Single Sign On (SSO) for ArcGIS at higher education institutions. Esri announced an agreement between Esri Eastern Africa Limited and the Federal Democratic Republic of Ethiopia to install free Esri geospatial software at more than 30 Ethiopian public universities. Tracy Jessop, assistant director of highways and transport at Norfolk County Council, UK details how the local authority is using Esri GIS to improve the school transport arrangements for almost 2,000 children with special needs, and help meet a cost-saving target of £500,000 this year.